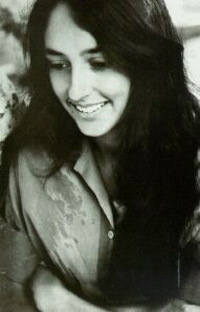 I had always liked Joan Baez, but about 13 years ago I instantly liked her even better. Joan was booked as a guest on my TNN talk show in 1993. Frankly, I was a bit apprehensive since I'd always figured she could be controversial and unpredictable in a live interview setting. Remember, my show was broadcast on TNN, a cable network aimed at rural, conservative country music fans. The big bosses at TNN were always uneasy about my show since I delighted in booking guests like Joan Baez... The Indigo Girls... Chris Robinson & The Black Crowes... Michelle Shocked... Arlo Guthrie... Ivana Trump... Hulk Hogan and others who didn't exactly fit the expectations of TNN's target audience. Joan was a gracious and engaging guest. She even brought an accompanist to play along with her. And trust me.... she paid for that accompanist with her own money. Our little show didn't pay a penny to guests. They appeared for the national exposure and, hopefully, because we offered an interesting, in-depth interview. It was late in the show when I convinced Joan to perform "Diamonds and Rust", one of her signature songs. The problem was.... after Joan started singing her song, my producer -- Gail Grasso -- realized we had one more mandatory commercial break to squeeze in, and we were running out of time. Gail was in the control room panicking. We absolutely had to go to commercial, but Joan -- at our request -- was busy pouring her heart into her beautiful song, with two verses left to go. Again, this was a live show.... there could be no editing. That's right, we cut off Joan Baez right at the best part of her signature song -- which I had convinced her to sing -- which she was performing for free, with an accompanist she was paying for. I just couldn't have felt any more disrespectful or intrusive! Gail ran from the control room, apologizing profusely.... I apologized as well. Now -- I figured -- the real Joan Baez might show her true colors, and throw a fit.... or walk off. Then came another startling revelation. Gail had jumped the gun. There actually would have been plenty of time to finish the song. Now we had four minutes to fill when the commercial break was over. 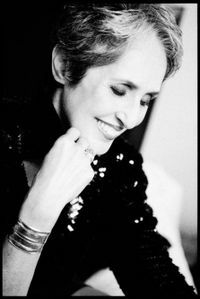 Joan Baez was not only gracious and amused.... she was sweet and understanding. She said she'd pick up right where she left off. And she did.... right on the same lyric.... and finished the song beautifully. Joan was in her early 50's that day. This week, she turned 65. But she's not retiring, or tiring. In the weeks ahead, she's touring in England, Scotland, France, Germany and Italy.